I can only hope so far that all my pieces have found happy homes. No word yet from anyone about having found any of them, but maybe I'm just not hitting the right neighborhoods yet :). There is, however, one great piece of encouraging news. The other day I heard from UK photographer David Wise who was inspired by the Lost Art project to leave his camera to be found on a mountaintop in Sri Lanka. He also wrote about that decision, and about my project, on his terrific N.U.M.A. blog, which I highly recommend. This bit of response, and the reminder of how far and fast an idea can travel, has definitely helped me find the motivation to continue. Thanks David! 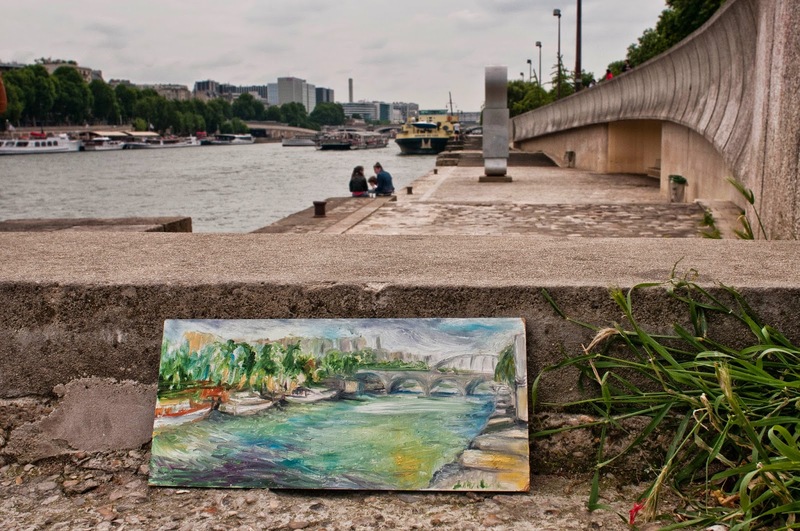 Today's painting was left on the left bank of the Seine, which should be crowded on such a lovely day. And the wait begins again! was left on the Quai Saint-Bernard in Paris on June 1, 2014 at 12:30pm.